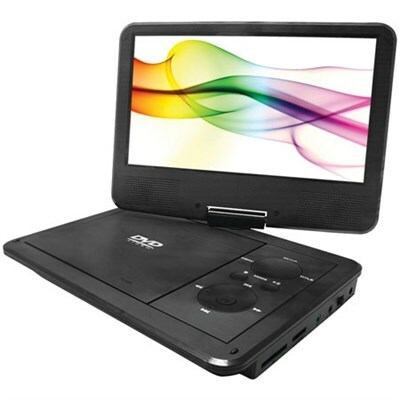 This 9" 180 percent swivel-screen portable DVD player is perfect for bringing your media on the go. The LCD screen folds flat for easy carrying. 5 hours of life from the onboard Li-Poly battery let you play two average-length movies. This player is compatible with DVD, DVD+-R/RW, CD, CD-R/RW, MP3 and JPEG, giving you playback versatility for many different formats. The USB input and SD Card slot let you play back digital files without having to burn them to an optical disc first. Includes remote, travel bag, earbuds and car/AC adapter.